Chef Jason Jillson plans to have his old-school salumeria, The Ham Stand, open in March. Pork belly futures may no longer be a thing — they stopped trading that commodity on the Chicago Stock Exchange in 2012 — but Nevada County residents can invest in local pork futures, thanks to a GoFundMe launched by aspiring salumiere Jason Jillson. A salumeria is an Italian old-world deli, where butchers steeped in tradition cure their own meats and make their own sausages. 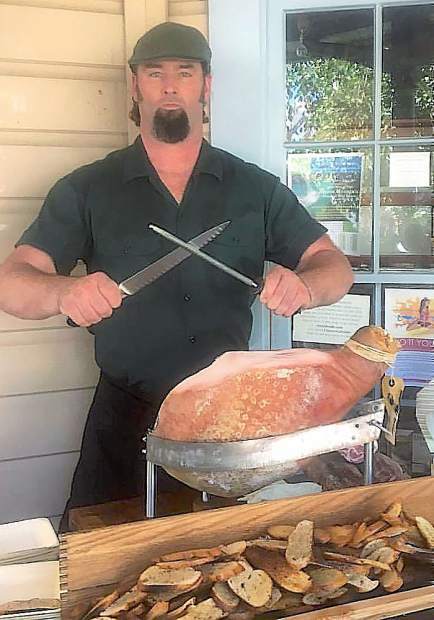 Jillson, the former executive chef at The Stone House, has been working to open one in Nevada County, The Ham Stand, in the former BYOB space at 821 Zion St., in Nevada City. “I hoped to have it up and running by now,” Jillson said Monday. He has revised that estimated opening date to March, he said, adding, “I could get lucky” and open earlier. Jillson is offering $200 in product when he opens in return for a $200 investment. Jillson, a Maine native, has been working in the hospitality industry since he was in junior high school. After attending culinary school, he worked as a chef for the Fairmont Hotels chain for five years and then moved to California and worked in catering. About eight years ago, he became fascinated with the art of making salume — Italian cured meats — even traveling to Alaska for a week-long seminar taught by master salumiere Francois Vecchio. “I decided I wanted to do it for myself, instead of making it for others,” Jillson said. Jillson relocated to Nevada County last year after visiting with his wife, whose family owns a home here. “I love the sense of community here,” he said. The former wine shop on Zion Street had been vacant for a while before Jillson leased the space, which he called ideal for his purposes. Jillson has big plans for The Ham Stand, which he envisions as a multi-pronged business. “At the forefront will be a European deli crossed with a New York delicatessen,” he said, offering sandwiches to showcase his cured meats and housemade condiments. He also will sell those products on their own, possibly including cuts from locally sourced beef as well and pre-made barbecued cuts like brisket and ribs. The Ham Stand will also offer limited catering and shipping of its products. Contact Staff Writer Liz Kellar at 530-477-4236 or by email at lkellar@theunion.com.